BelarusDigest > All > Is Belarusian Government About to Close Down the Ukrainian Border? On 16 December, President Lukashenka requested that Belarusian security agencies not neglect the consequences which the situation in Ukraine created for Belarus. He referred to the recent case of a former Donbas war veteran detained with weapons and explosives at the railway station in Minsk. Meanwhile, the Belarusian State Border Committee reported about serious rise in illegal attempts to bring weapons and munition from Ukraine. Minsk is worried about possible movement of weapons, radical activists and ideas from Ukraine. 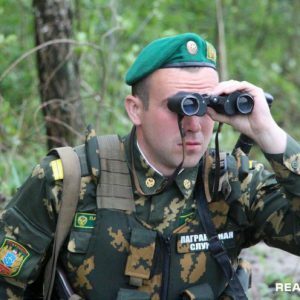 The authorities started to fortify Belarusian border with Ukraine just as the Maidan protests began in 2013. But Belarusian government tries to avoid provoking Kyiv by turning the border into an iron curtain. Do arms and militants come to Belarus from Ukraine? On 15 December, Belarusian Minister of Internal Affairs Ihar Shunevich told the Russian news agency RIA Novosti that his Ministry referred the materials concerning 12 participants of Donbas war to the Investigation Committee. The Committee decides about their possible criminal prosecution. The complete list of Belarusian citizens who are suspected to fight in Donbas includes more than 100 names, emphasised Shunevich. The Minister's statement became even more pronounced politically as Shunevich underlined that among these 12 persons are those who fought on both sides of the conflict. Unlike in Belarus, in Russia fighting against Ukraine's government forces in Donbas war is not crime, but a laudable deed. Minsk wants to prevent its citizens from taking part in the Ukraine conflict. In June, the Chairman of State Security Committee Valery Vakulchyk announced that the Belarusian combatants would face prosecution as mercenaries. In August, a state TV channel reported that security agencies found in Minsk a recruiting scheme which facilitated sending mercenaries to Donbas. On 26 November, a Belarusian citizen who previously fought on the Ukraine side in Donbas has been detained at the Minsk railway station as he had with him arms and explosives. Belarusian non-state media could confirm the identity of the man and his participation in war. On 17 December Leanid Maltsau, chairman of the State Border Committee, Belarusian security agency responsible for border control reported that in 2015 Belarusian border guards seized 53 items of weapons, 500 rounds of ammunition as well as some drugs on the Belarus-Ukraine border. That is a lot, because on the borders with Lithuania and Poland they interdict only single pieces of weapons. Minsk clearly fears that instability and war in Ukraine gives new opportunities for both political radicals and criminals. As a result, Belarus started constructing its border with Ukraine as the situation in that country became unstable in November 2013. Demarcation of the border will expectedly take eight years and cost about $10m. On 2 December the biggest Belarusian Internet-media outlet Tut.by published a story about the demarcation. So far, at the westernmost end of the Belarus-Ukrainian border it looks harmless: workers have installed border marks and removed vegetation along the five metres wide strife on Belarusian side. By now, is has been done on about 400 km out of the total 1,084 km. The State Border Committee, however, said Tut.by that at the moment Belarusian government has not taken any decision on installing on the Belarus-Ukrainian border more sophisticated fortifications and control equipment such as alarm system, barbed wire, control strife – similar to those installed on the Belarus-Polish border. It means that Belarusian officials feel comfortable with the situation on the southern border. Indeed, in October, Belorusskaya Voennaya Gazeta, the official Defence Ministry daily published a remarkable report describing loose fortification of the Belarus-Ukrainian border. The article described a border outpost which controlled 40 km of border with difficult natural conditions – lakes, Dnyapro-Buh Canal, woods and few settlements. No easy job especially given the developed smuggling routes in the region. Soviet military standard requires a company be stationed at such border outpost. The outpost in vicinity of Pinsk described in the article hosts only a strengthened platoon. That means about 30 men. Even though new equipment like electronic control devices and drones assist them in guarding the frontier that means quite loose border control of the frontier with Ukraine. This relaxed approach is probably dictated not only by the lack of money in Minsk's pockets but by some major decision to avoid a rupture between the two countries. A comparison with a similar situation in the former Soviet Union can illustrate this point. For instance, when Uzbekistan faced in 1990s the risks related to political radicalism, instability and war in neighbouring Tajikistan it simply introduced visa regime and mined its borders regardless of how dramatically this move tore the relations between the people. The statements of Belarusian officials also prove that they do not see any major threat in the south, except for general instability and economic decline. On 17 December, Leanid Maltsau, chairman of the State Border Commitee, characterised the situation on Belarus-Ukrainian border as “usual.” He emphasised “complete mutual understanding” with Ukrainian border guards. Lukashenka himself at the conference with Belarusian top security officials on 16 December looked more concerned about economic issues involving the border with Ukraine rather than any security risks. He reminded that on 1 January 2016 the free trade agreement between Ukraine and the EU would enter into force and members of the Customs Union had to defend themselves before the arrival of the EU's goods. Belarusian government expressed concern that these goods can enter the country without customs control via Ukraine and Belarus-Ukrainian border and cause serious damage for Belarusian economy. That corresponds with how Belarusian government behaves itself toward Ukraine in recent years. In particular it refused to support Russian interventions in that country and willingly cooperated with Kyiv in economic and defence spheres. Belarusians and Ukrainians never in their history were divided by a real state border. Now they construct a border. Fortunately, so far this drawing a boundary resembles more cautious demarcation of own territory rather than rupture of links out of fear before security threats. After all, good fences make good neighbours. Furthermore, Belarus constructs its fence with Ukraine after Minsk consistently supported the Ukrainian statehood since the Russia-Ukraine conflict started. If other regional and global powers acknowledge and support this policy of Minsk, it may lead to a more secure and solidarity-based region in the future. 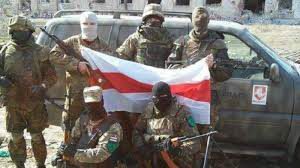 The Belarusian authorities threaten mercenaries originating from Belarus who participate in the Ukraine conflict with large prison terms. Belarusians cancel their New Year tourist plans because of terror attacks at popular tourist destinations. The trade ministry tries to regulate the rapidly growing sector of online commerce. The hotel sector in Minsk faces hard times. The government plans to introduce changes to immigration rules. All of this and more in the new edition of the Belarus State Press Digest. Mercenaries from Belarus who participate in the Ukrainian conflict can receive up to 7 years in prison. Narodnaja Hazieta discusses the problem of Belarusian mercenaries, who undermine the authorities' peacekeeping efforts and provoke the continuation of armed conflict in search of income. It points to the recent case of a mercenary who fought for the Ukrainian Right Sector and was recently arrested at Minsk railway station in possession of weapons and explosives. The newspaper compares the Belarusian fighters with ISIS radicals. However, it mentions only mercenaries who fight on the side of Ukraine, while being silent on the pro-Russian fighters. According to the Belarusian security services, the numbers of both groups are the same. This year few Belarusians wish to travel to Western Europe and Egypt for New Year. The companies admit that recent attacks on popular tourist destinations have discouraged their customers from travelling, writes Belarus Segodnya. They prefer to sit at home rather than risk their lives. Stable interest remains only for tours in the Baltic countries and Scandinavia. Meanwhile, inbound tourism remains almost entirely dependent on the Russian market, which fell by 40 per cent this year. Currently Russians often prefer to spent a holiday in their own country, where some excellent health resorts are emerging. More than 700 applicants from across the country participated in the first competition for local initiatives under the EU/UNDP project. Overall, the jury approved 87 projects within the Support to Local Development in the Republic of Belarus programme. In Mahilioŭ region 17 institutions and organisations have received financial support to put forward their ideas: from popularising traditional handicrafts to the festival of folk art. Siel'skaya Gazeta reports on the grant winners from Kličaŭ district, who put forward a business project of greenhouse vegetable production and received full support from the local authorities during the application procedure. Environmentally friendly production was one of the conditions of the UN grant programme. Ministry of Trade will strengthen control over online commerce. Zviazda newspaper published a number of initiatives that the Ministry of Trade will take to regulate the rapidly growing sector. The authorities are discussing a tax on purchases in foreign online shops. Social media also appeared in focus because the goods and services advertised there are often illegal or fail to meet quality standards. The online alcohol trade in Belarus is likely to largely disappear in the near future, as the Ministries of Health and the Interior oppose it. The government also plans to launch an attestation for internet shops which sell electronics like laptops and mobile phones, which make up a vast shadow market. This year 35 internet shops were closed by the order of the ministry for violation of law. Belarusians show low use of banking services. Belarus Segodnya analyses the research ordered by the National Bank in September, which reveals curious tendencies in the financial behaviour of the Belarusian population. 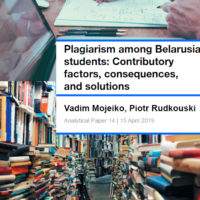 Belarusians are considered to be prudent, cautious and thrifty, but the results of the study call this view into question. Almost one in ten Belarusians do not use banking services at all. Only 21.5 per cent of the population and less than a third of households invest their savings in banks. Meanwhile, every fourth Belarusian, and almost 40 per cent of households use bank loans, and the figures have been the same for the last few years. The study concludes that Belarus is a country with relatively low use of financial services. Hotel business in Minsk faces hard times. Although competition on the hotel market is growing year by year, prices remain quite high and the quality of service low, Respublika newspaper reports. 2015 and especially the beginning of the year were tough for hotels, as the number of tourists from Russia fell sharply. Today the sector is divided into successful and unsuccessful hotels, where the former have sufficient number of customers and the latter critically lack them. The hotels expect to increase the flow of tourists through the ever-changing geopolitical environment around Belarus. Otherwise, less successful hotels will suffer even more as competition in the market increases. In the next two years 15 new hotels are expected to appear in Minsk. Belarusian authorities plan to check migrants' knowledge of the Constitution. At first this will only apply when obtaining citizenship, Souyz newspaper reports. In 2015 the flow of migrants increased markedly, and 1,160 people from 23 countries applied for refugee status. Most of them come from Ukraine (75%), Syria (17%) and Afghanistan. Although the largest number of Ukrainian refugees settled in Russia, Belarus took most if counted per capita. About 150,000 Ukrainian citizens arrived in Belarus in the last two years, according to the Interior Ministry. Administration of the Brest Fortress memorial complex is worried about the increase in illegal guided tours. Zaria newspaper from Brest reports on the tricks of illegal guides in Brest Fortress, a memorial famous across the post-Soviet world. Unlicensed guides recruit tourist groups via the Internet, catch them near hotels, or even in the territory of the memorial. If approached, they argue that they simply walk with their relatives or friends, and the facts of payment for the service is hard to spot. The administration argues that illegal guides discredit the image of the Soviet defenders, the memorial, the residents of the city and Brest itself by their unprofessionalism. Many of them do not even know the key dates of history and confuse simple facts. The State Digest Digest is based on review of state-controlled publications in Belarus. Freedom of the press in Belarus remains restricted and state media convey primarily the point of view of the Belarusian authorities. This review attempts to give the English-speaking audience a better understanding of howBelarusian state media shape public opinion in the country.